THE MARAETOTARA HYDRO-ELECTRIC POWER SCHEME. HISTORY OF THE SCHEME;Rev. 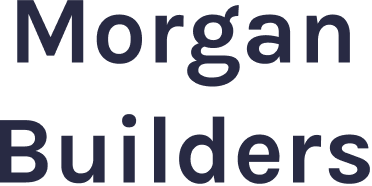 Mar Waugh was the originator of the scheme. Driving up the Maraetotara Valley in the course of his ministerial duties, he was struck with the potential of the river and suggested the construction of a hydro-electric scheme to the Havelock North Town Board, who considered the idea favourably, and asked engineer Mr Climie to report. 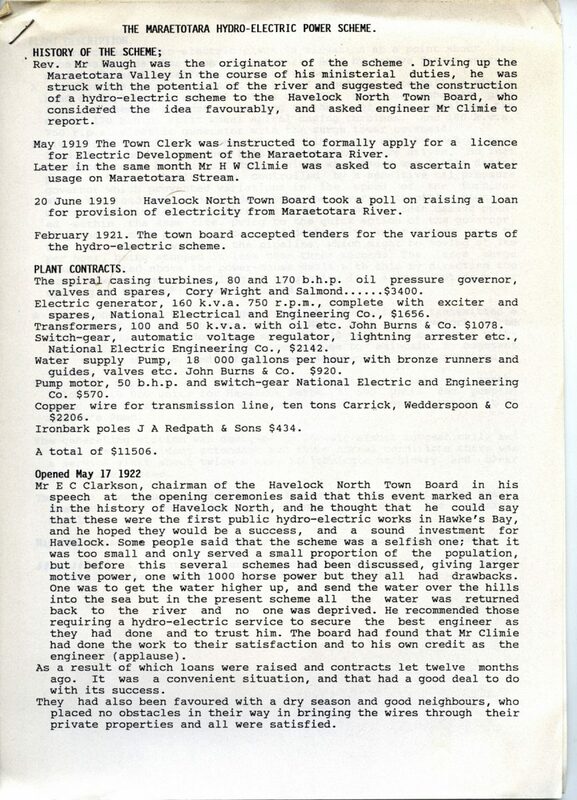 May 1919 The town Clerk was instructed to formally apply for a licence for Electric Development of the Maraetotara River.Later in the same month Mr H W Climie was asked to ascertain water usage on Maraetotara Stream. 20 June 1919 Havelock North Town Board took a pool on raising a loan for provision of electricity from Maraetotara River. February 1921. The town board accepted tenders for the various parts of the hydro-electric scheme. PLANT CONTRACTS.The spiral casing turbines, 80 and 170 b.h.p. oil pressure governor, valves and spares, Cory Wright and Salmond $3400.Electric generator, 160 k.v.a. 750 r.p.m., complete with exciter and spares, National Electrical and Engineering Co., $1656.Transformers, 100 and 50 k.v.a. with oil etc. John Burns & Co. $1078.Switch-gear, automatic voltage regulator, lightning arrester etc., National Electric Engineering Co., $2142.Water supply Pump, 18 000 gallons per hour, with bronze runners and guides, valves etc. John Burns & Co. $920.Pump motor, 50 b.h.p. and switch-gear National Electric and Engineering Co. $570.Copper wire for transmission line, ten tons Carrick, Wedderspoon & Co $2206.Ironbark poles J A Redpath & Sons $434. Opened May 17 1992Mr E C Clarkson, chairman of the Havelock North Town Board in his speech at the opening ceremonies said that this event marked an era in the history of Havelock North, and he thought that he could say that these were the first public hydro-electric works in Hawke’s bay, and he hoped they would be a success, and a sound investment for Havelock. Some people said that the scheme was a selfish one; that it was too small and only served a small proportion of the population, but before this several schemes had been discussed, giving larger motive power, one with 1000 horse power but they all had drawbacks. One was to get the water higher up, and send the water over the hills into the sea but in the present scheme all the water was returned back to the river and no one was deprived. He recommended those requiring a hydro-electric service to secure the best engineer as they had done and to trust him. The board had found that Mr Climie had done the work to their satisfaction and to his own credit as the engineer (applause).As a result of which loans were raised and contracts let twelve months ago. It was a convenient situation, and that had a good deal to do with its success.They had also been favoured with a dry season and good neighbours, who placed no obstacles in their way in bringing the wires through their private properties and all were satisfied. PLANT DESCRIPTION.The Maraetotara hydro-electric plant is situation at a point about 2km from Waimarama Road on Maraetotara Road by native forest where a series of small waterfalls enhance its beauty.A dam of 1,8 metres was built on top of a natural waterfall to give a head of 21,3 metres and 640 metres of 0,91m diameter concrete pipe line was used as a penstock leading to the power house containing the 80 and 170 b.h.p split wheel spiral casing turbines, and 160 k.v.a. 750 r.p.m. electric generator with the surge tower overhead.It is calculated that the generating machinery was able to meet a peack load of 250 horsepower when both turbine wheels were driven, so that the water could be shut off during night when there was little demand power. These wheels were controlled by a sensitive oil pressure governor which prevented variations in the speed of the turbine. When the load was suddenly decreased the governor throttled down the water supply in less than three seconds, and on a sudden demand opened within the same time. Owing to the quick action of the governor, they had to make provision to avoid destructive water hammer due to the 430 tons of water in the pipeline, which might be moving at 7km per hour, being stopped in less than three seconds. The large surge tower erected above the power-house dealt with this by directing the surge upwards and controlling it by gravity if a sudden shut-down or opening of the turbines was required. A three-phase current was generated at 3300 volts and transmitted a distance of 9km through the gap by Te Mata Peak to Havelock North before being stepped down to a standard 230 volts. 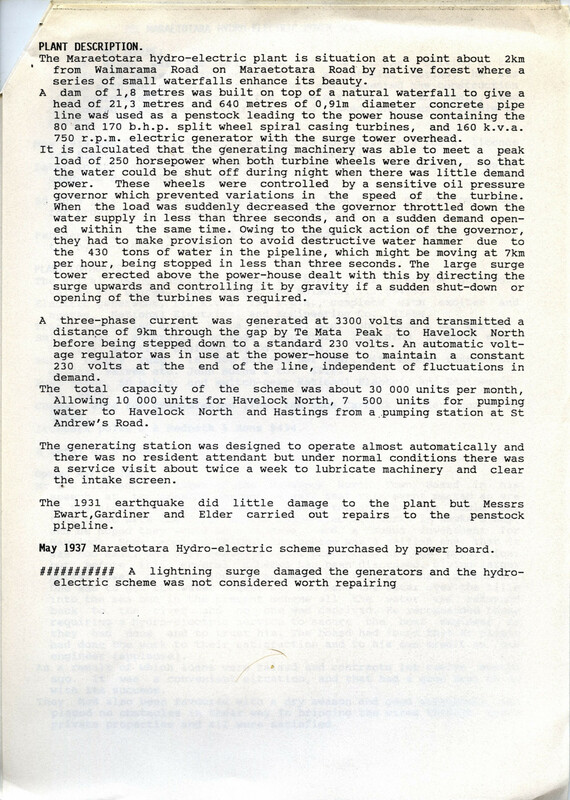 An automatic voltage regulator was in use at the power-house to maintain a constant 230 volts at the end of the line, independent of fluctuations in demand.The total capacity of the scheme was about 30 000 units per month, Allowing 10 000 units for Havelock North, 7 500 units for pumping water to Havelock North and Hastings from a pumping station at St Andrew’s Road. The generating station was designed to operate almost automatically and there was no resident attendant but under normal conditions there was a service visit about twice a week to lubricate machinery and clear the intake screen. The 1931 earthquake did little damage to the plant but Messrs Ewart, Gardiner and Elder carried out repairs to the penstock pipeline. May 1937 Maraetotara Hydro-electric scheme purchased by power board.